-There are 3 penthouses on 8. Fl. 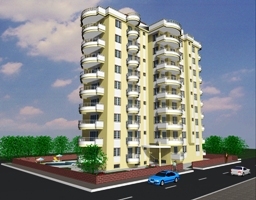 -On the ground floor there is a 1 bedroom and two 2 bedrooms apartments. -Two bedrooms, two balcony, 2 bathrooms (en suite and seperate, 1 living roob with American style kitchen. -Penthouses have 4 bedrooms, 1 living room, 3 baths, 2 WC, terrace.